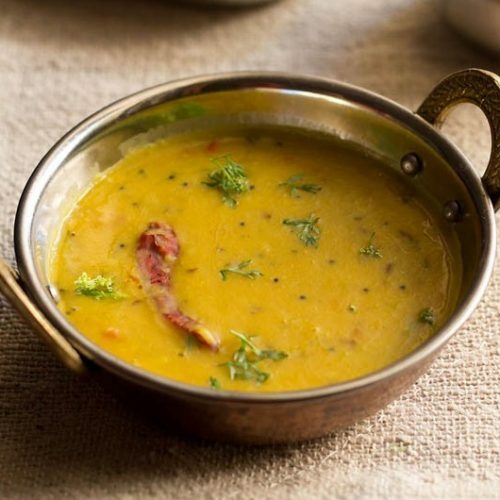 dal fry recipe restaurant style - popular indian dal recipe made with pigeon pea lentils. 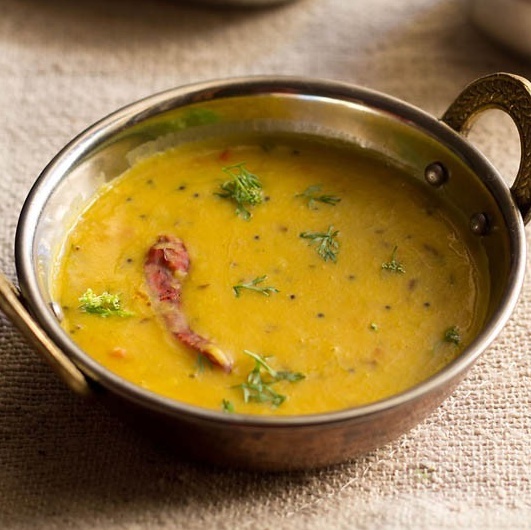 this dal fry recipe gives a delicious restaurant style taste. dal fry restaurant style recipe with video and step by step photos – dal fry is another popular and delicious indian dal or lentil recipe. 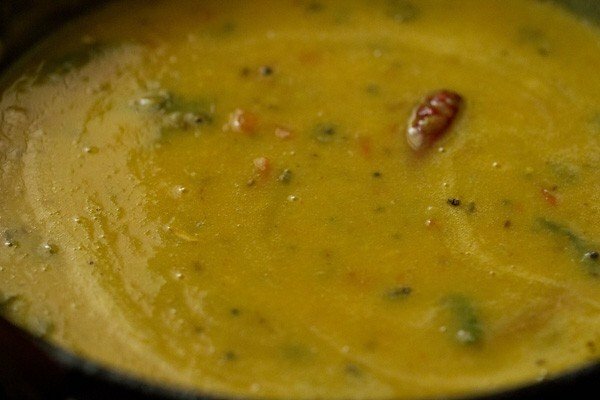 this dal fry recipe tastes more like what is served in restaurants. 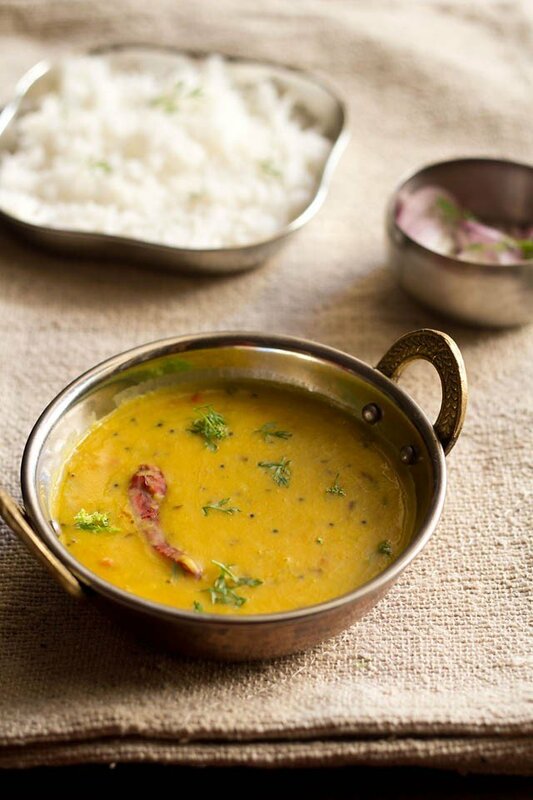 dal fry is usually prepared with arhar dal also known as tur, toovar or yellow lentils or pigeon pea lentils. 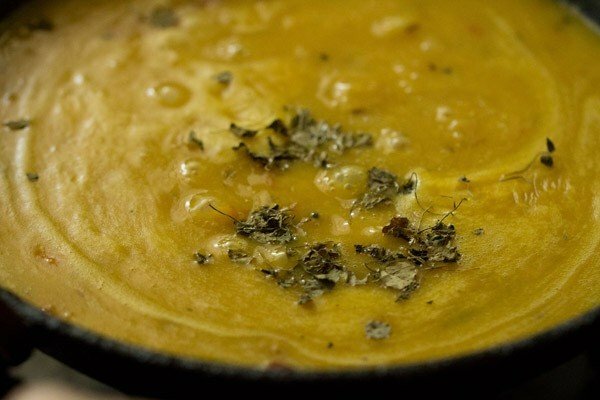 you can also use masoor dal or moong dal to make this recipe. 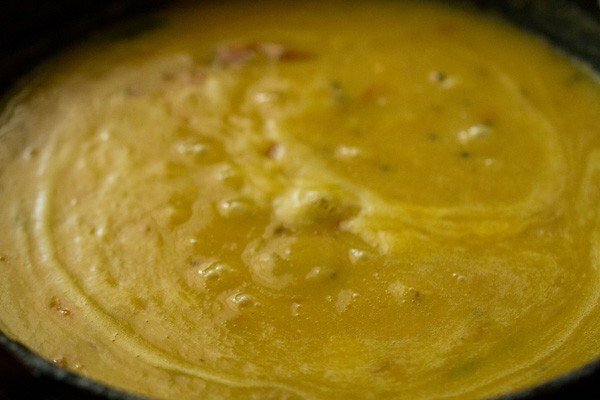 both dal fry and dal tadka are two popular dal dishes served in indian restaurants. dal fry is not thin and usually has a medium to thick consistency. you can adjust the amount of water you want when you prepare it. these two dal recipes are also famous in the road side dhabas (roadside eateries) of india. but the dals served in the dhaba have a different taste. 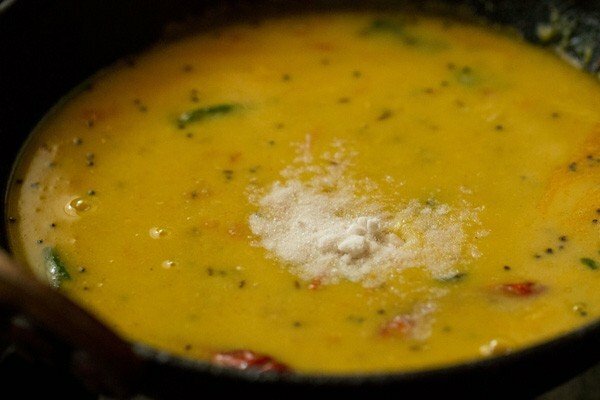 i had recently posted a dal recipe which is made in the dhaba style. i tried it first time and the results were too good. it almost tasted like the dhaba dal. here is the link: dhaba style dal fry. there are many ways of making dals and i will keep on posting the different ways of making them. 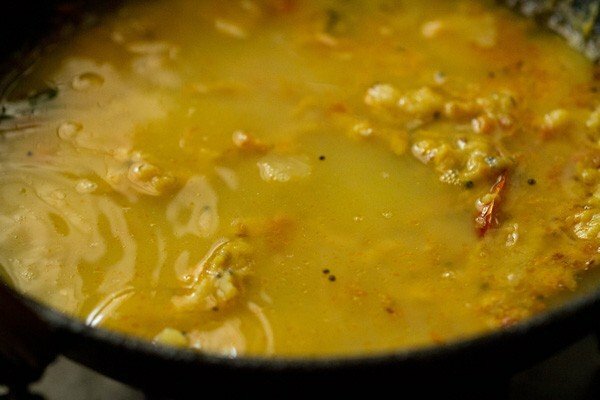 take ½ cup tuvar dal (arhar dal or pigeon pea lentils) OR half-half of tuvar dal and masoor dal (pink or orange lentils). rinse the lentils in water for a couple of times. then add the lentils in a pressure cooker. also add a pinch of turmeric powder (haldi) and 1.5 cups water. pressure cook the lentils for 8-9 whistles on a medium flame till they are cooked completely. once the dal is cooked, then mash the dal lightly with a wired whisk or with a spoon and keep aside. in another pan heat oil or ghee or unsalted butter. add the mustard and let them splutter. when you hear the spluttering sound of the mustard seeds, add the cumin and fry them. 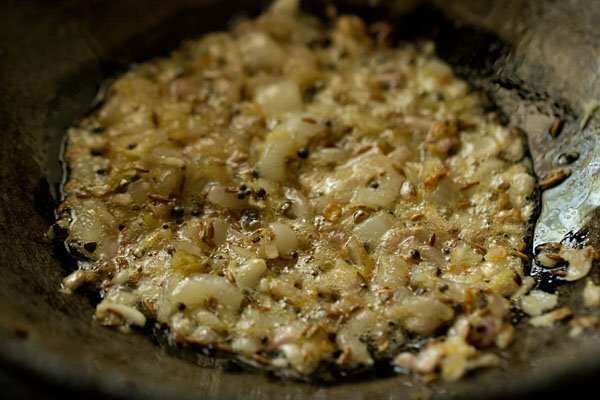 now add the ginger-garlic paste and fry for some seconds till their raw aroma disappears. add the green chilies, red chilies, curry leaves and stir. add all the spice powders - turmeric powder, red chili powder, asafoetida powder. and fry for some seconds. add the tomatoes and cook till they soften and you see oil releasing from the sides. now add the mashed dal. stir well. add water + salt. 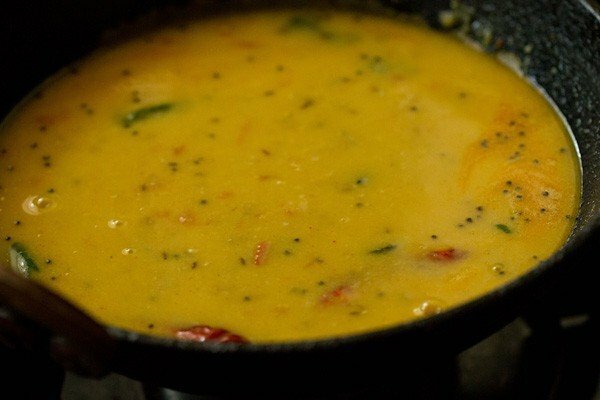 stir and simmer the dal for 4-5 minutes more or till you get a smooth and slightly thick consistency. 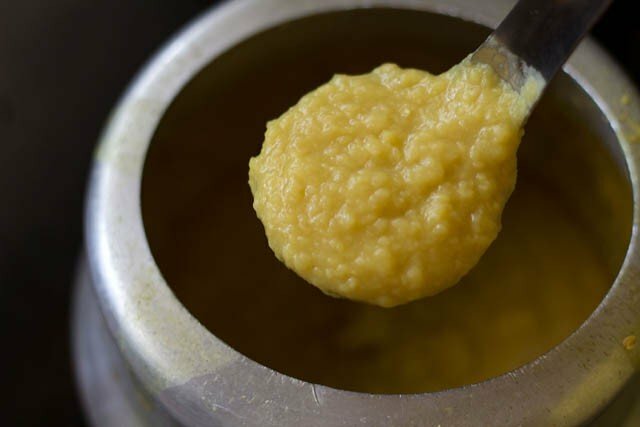 dal fry is not thin and is usually has a medium to thick consistency. so you can adjust the amount of water you want. keep the dal medium consistency if you prefer. making it thin will spoil the taste. lastly crush the kasuri methi on the palms of your hands and add them to the dal. then add garam masala powder. simmer for a minute. 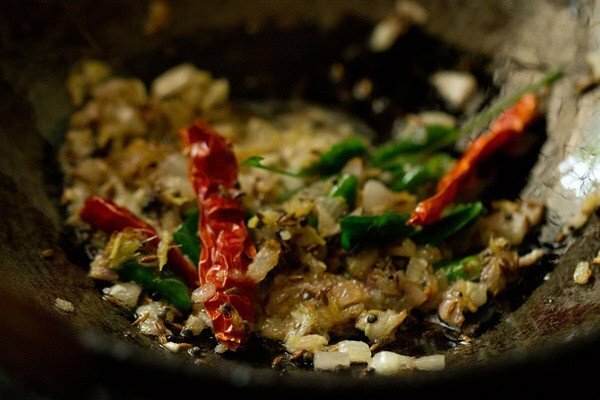 switch off the fire and add chopped coriander leaves. add lemon juice if you want, at this stage and stir well. now you can garnish the dal fry with some more coriander leaves while serving. 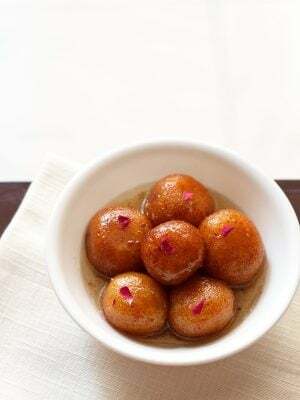 while serving top the dal fry with some ghee or butter if required. 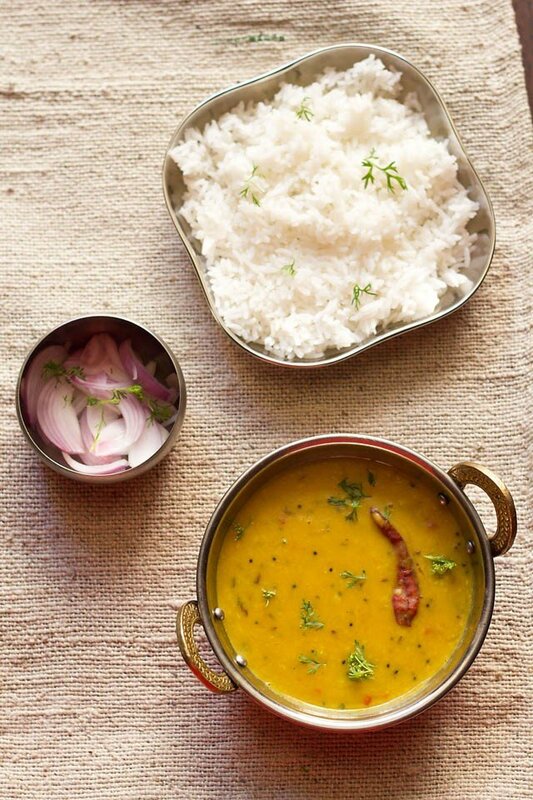 serve dal fry hot with steamed basmati rice, biryani rice, jeera rice or saffron pulao. dal fry also goes well with rotis or naan. 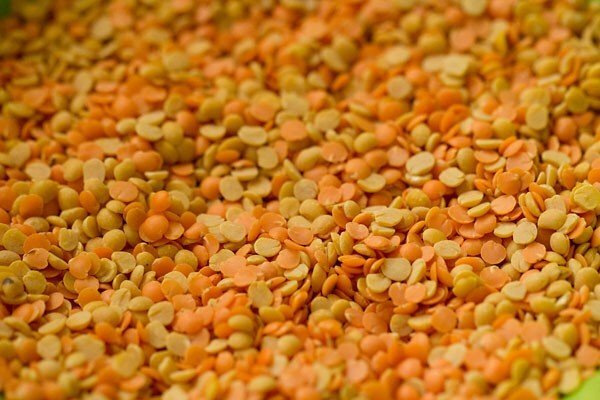 1: take ½ cup tuvar dal (arhar dal or pigeon pea lentils) or half-half of tuvar dal and masoor dal (pink or orange lentils). rinse the lentils in water for a couple of times. 2. then add the lentils in a pressure cooker. also add a pinch of turmeric powder (haldi) and 1.5 cups water. 3. pressure cook the lentils for 8-9 whistles on a medium flame till they are cooked completely. 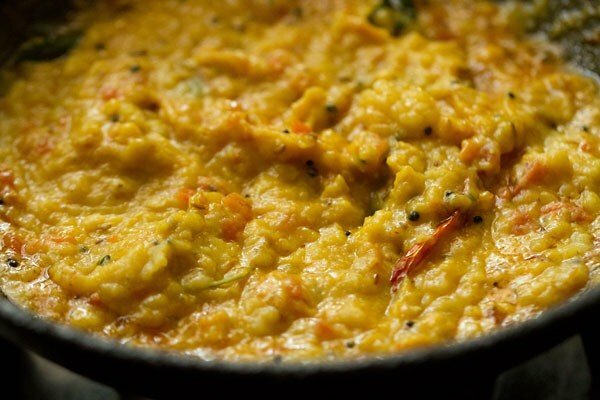 once the dal is cooked, then you mash the dal and keep aside. you can see the doneness of the dal and consistency in the below pic. 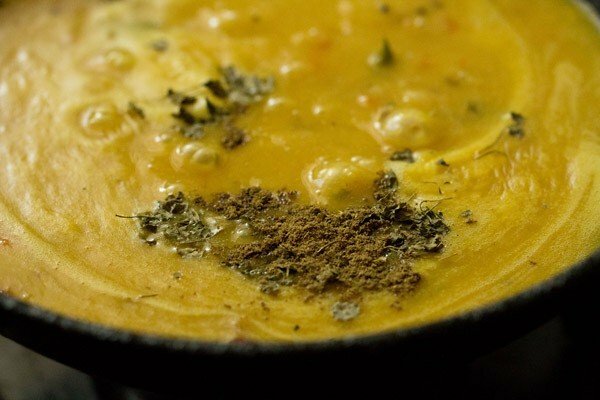 the lentils are cooked till completely soft. there should be no separate grains visible. 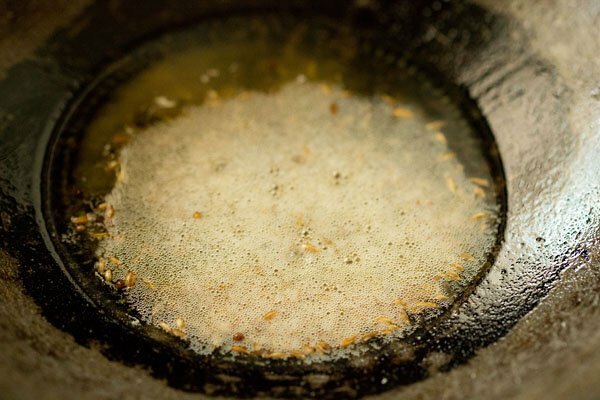 4: in another pan, heat 2-3 tablespoon oil or ghee or unsalted butter. 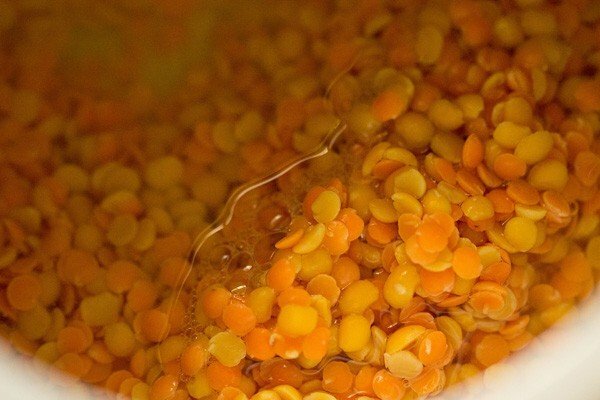 add ½ or ¾ tsp black mustard seeds (rai). 5. once the mustard seeds start crackling, then add 1 tsp cumin seeds/jeera and saute them for some seconds till they change color and crackle. 6. then add 1 medium sized chopped onion, about ⅓ cup chopped onions. 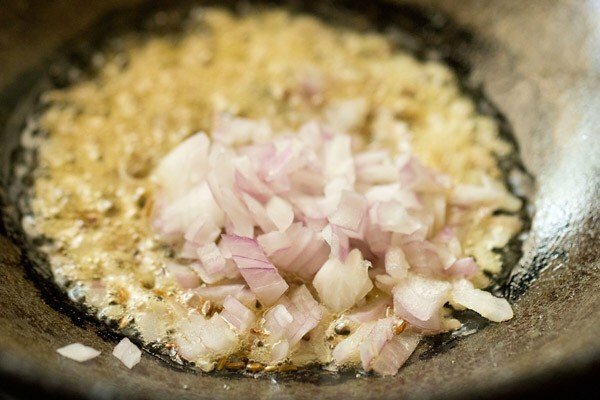 7. saute till the onions become translucent or lightly browned. 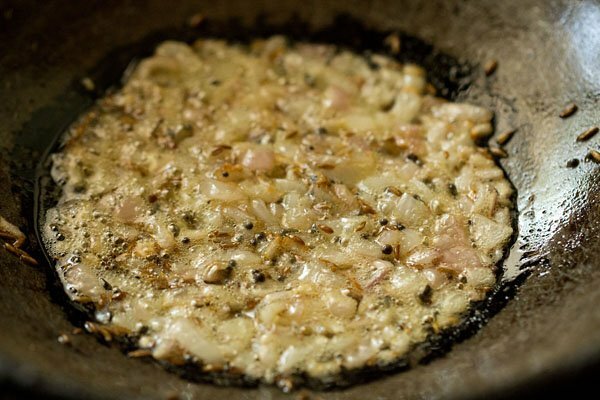 8. then add ginger-garlic paste (½ inch ginger + 3-4 garlic, crushed or made into a paste in a mortar & pestle). 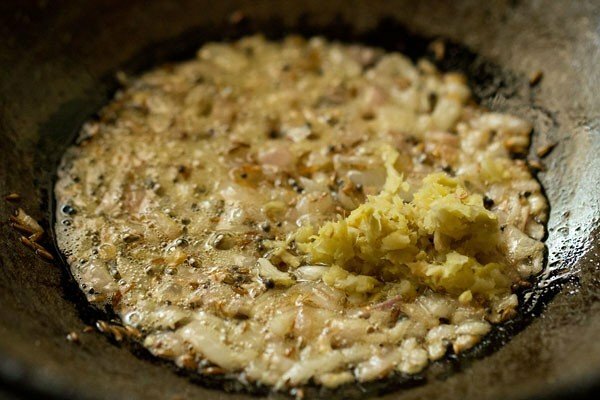 9. saute till the raw smell of the ginger-garlic disappears. 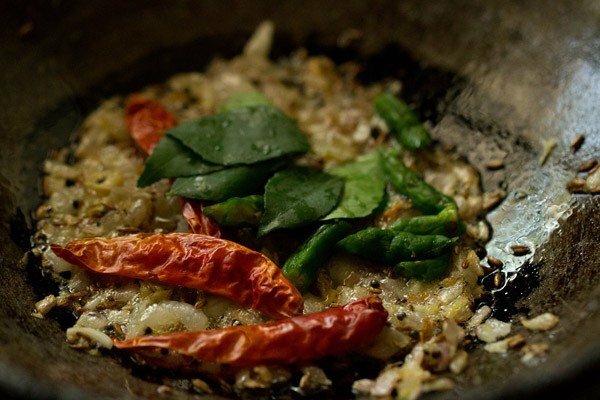 10. add 10-12 curry leaves, 2-3 dry red chilies, 1 or 2 green chilies. 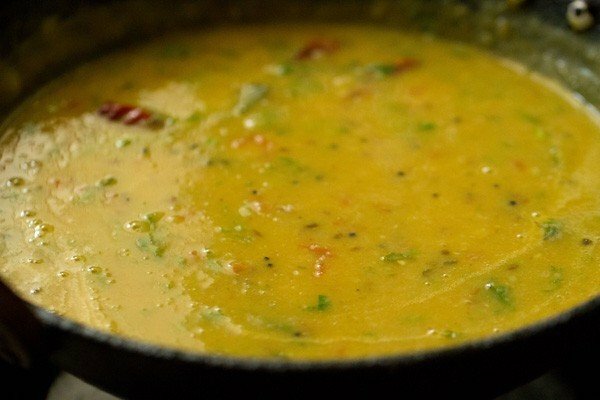 i have added curry leaves as they give a very nice flavor to the dal. 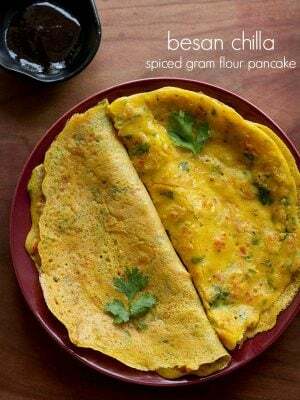 12. now add all the spice powders – ½ tsp turmeric powder, ½ tsp red chili powder, 1 to 2 pinches of asafoetida. stir. 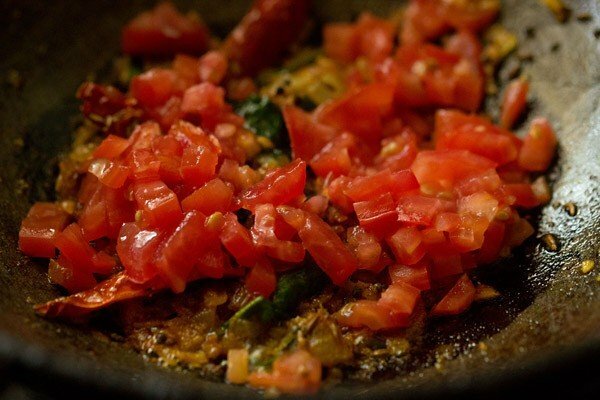 13. now add 1 medium sized chopped tomatoes (about ⅓ cup finely chopped tomatoes). 14. stir and saute till the tomatoes become soft and pulpy. 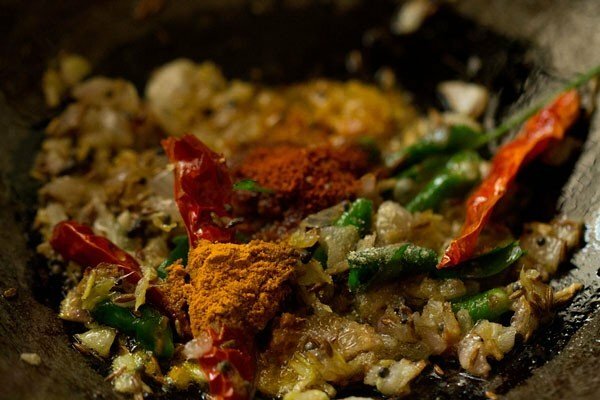 the oil should also start to leave the masala mixture. this an indication that the onion-tomatoes base mixture is cooked. 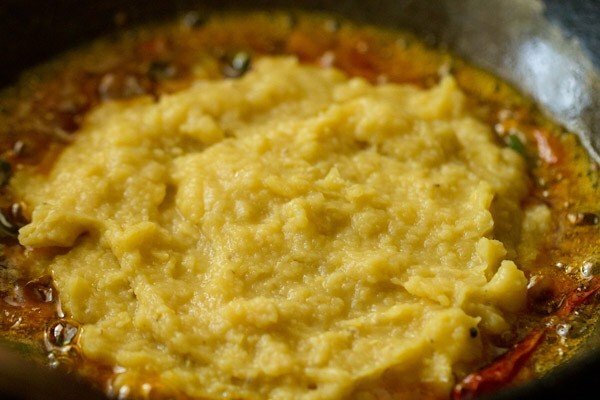 15. add this fried mixture to the dal or add the mashed dal to the fried mixture. 16. stir the dal well with rest of the masala mixture. 17. then pour 1 to 1.5 cups water. 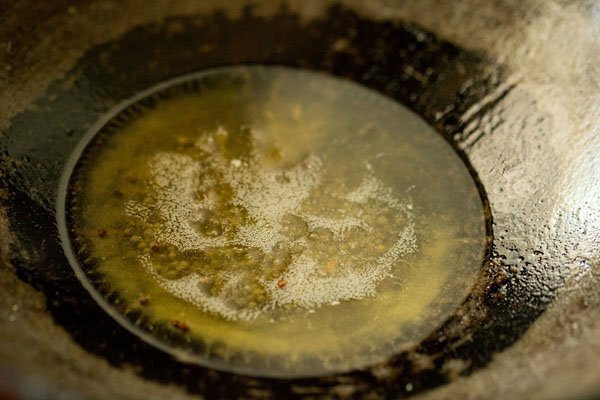 you can adjust the consistency of the dal fry by adding more or less water. 18. stir very well to get a smooth & even consistency. 19. then season with salt. 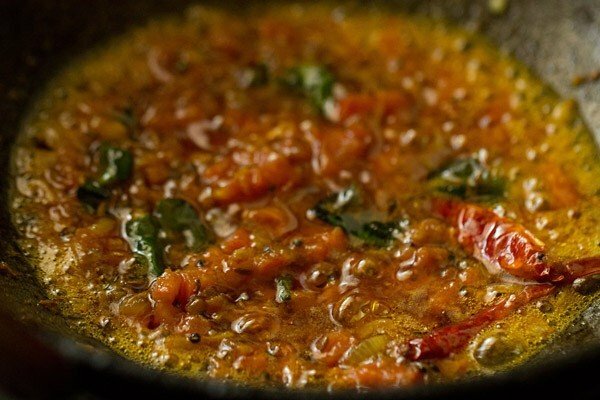 20. stir and simmer the dal fry for 5 to 6 minutes on a low to medium flame. 21. lastly add 1 tsp crushed kasoori methi/dry fenugreek leaves. 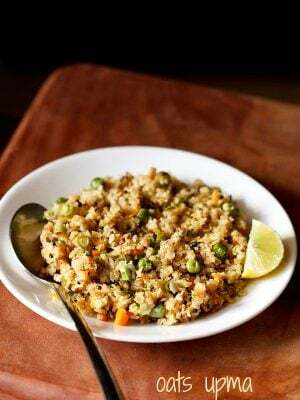 you can also substitute kasoori methi with a pinch of fenugreek seeds powder. if you don’t have either, then just skip. 22. then sprinkle ¼ to ½ tsp garam masala. if using homemade and a strong garam masala, then you can add ¼ tsp. 23. stir and simmer dal fry for a minute. 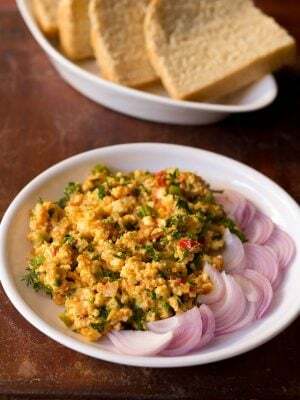 24. switch off the flame and lastly add 2 tbsp chopped coriander leaves. you can also add ½ to 1 tsp lemon juice towards the end if you prefer. 25. stir one last time. 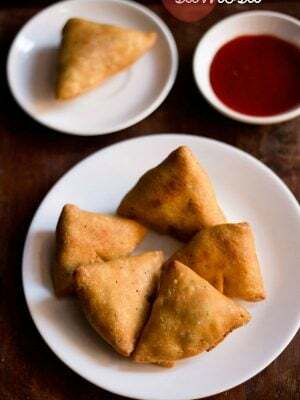 26. serve dal fry hot with parathas, rotis, jeera rice or plain steamed basmati rice accompanied with onion-tomato raita, papad, lime/lemon slices or mango pickle or onion salad or kachumber. 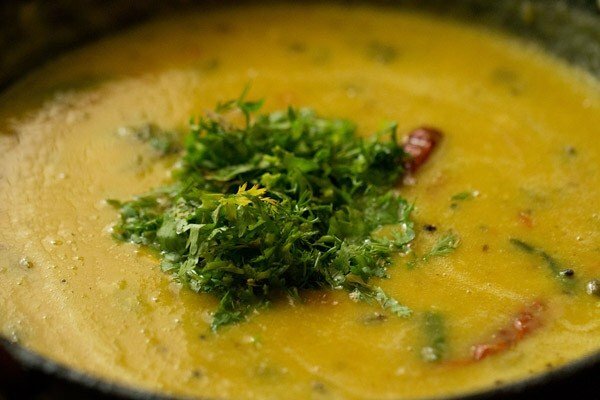 you can also garnish dal fry with some more coriander leaves while serving. Hi, I am a frequent visitor of your site. You have some of the best veg recipes. If i want to serve 12 people.. do i triple the recipe ? you can triple the recipe, but when adding hing, spice powders, kasuri methi please use the method of approximation or andaaz. Which garam masala do you use? 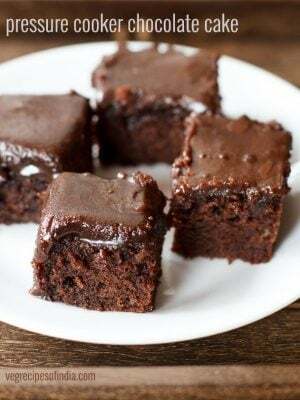 Amazing recipe. Tastes like authentic dhaba style dal. Thanks for putting up these recipes Dassana. Your site is my number one go-to resource for the most consistently delicious recipes. Welcome Minoo. Glad to know this. Thanks for sharing positive feedback on dal fry recipe. All your receipes deserve 5 star rating. If everyone starts following your receipes then hotels will have a tough time.. Thanks Priti for your 5 star rating and positive words.